Too many businesses fail within the first year of operation. Why? We have done the research and have identified what we feel are the 9 biggest mistakes business owners make and now wanted to share them with you. They lack real experience in the business. They never tested their concept. They didn’t properly identify their ideal customer. They never completed a financial forecast. They had no marketing strategy. They failed to clearly understand their competition. They picked the wrong location. They didn’t estimate properly how much money opening a business was going to cost. They never had a business plan. Don’t fool yourself. You either have the experience or you don’t. If you don’t, then go and get some. Starting a business is not an easy task and can cost you your life savings if you don’t know what you are doing. Many entrepreneurs think they only need passion, energy and money to start-up a business. Unfortunately, this obviously is not the case. You need experience and knowledge about the business that you want to start. Your idea can wait. Go and run your idea by someone who will give you an honest opinion. Stay away from friends and family. Find that person who has done what you are thinking of doing and then listen. You can easily make changes to your concept before you get started. Clearly define who you are going after. Who are they? What do they do? How much do they make? Where do they live? Where are they buying now? You have to know everything and I mean everything about them. Once you know who they are then you are not guessing who your website is aimed at? How about the music playing in your store? Right again. This is the big one. People guess what sales they’ll make and take a stab at the expenses. Wrong, wrong, wrong. You have to complete an income statement for your first year before you’ve done anything else. Does the idea have legs? The forecast will answer that question. How are you going to attract your ideal customer? How busy do you want to be? Are you going to use traditional marketing ideas or use social media and the web to drive traffic? You have to make these decisions ahead of time so you can put together a budget. It isn’t that you have to know who they are; it is that you have to know EVERYTHING about them. They are looking at you so look at them. What do they do well? What do they do poorly? How can you exploit their weaknesses? This is ongoing, even after you open, so get used to it. Most business people think that location is everything. Try and do the best you can but do not think that location is #1. Service is. Obviously, do not pick a wrong location. Be patient. Stay within your price range. Customers will find you if you are good at what you do. 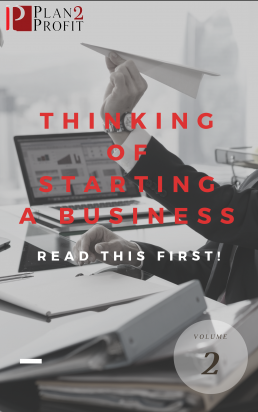 Starting a business is exciting. There is construction and purchasing and hiring and the grand opening. Fun? Wow! And there are costs they didn’t allow for such as: Deposits to utility companies, First and LAST month’s rent, Training labor, Inventory that arrives C.O.D. Then there are all the little bumps in the road that cost money. What’s left for working capital? Ouch. This is always a show stopper. The dreaded business plan! Most go forward without it. They have no idea where they are going; so how are they going to get there? They are not. Final answer – Fail to plan and plan to fail. You can do the work before you open your business and succeed or close your eyes and hope for the best. Who are you going to be? There you have it. Do the work before you spend your money and you have a better chance to survive – even thrive – in the great business of business entrepreneurship.